Yesterday I decided I needed to actually rip into the aft cabin and take apart the bed to get to the batteries. Lead-Acid cells, all of them, need to be checked from time to time for evaporating water from the electrolyte. I installed one set of batteries in August last year, the second set here in Norfolk and did the wiring job. I apparently missed a few steps with our system I should have paid more attention to. How I discovered I missed the steps was a night from hell last night. Let me start in the aft bedroom. I pulled the mattresses. We’ve been here for just over a week and when I put them down they were dry as a bone, unblemished and practically new. When I pulled them, the bottoms were damp, mildew had begun to form on the bottom. The wet, rainy days and closed cabins contributed to this problem with condensation all over the cabin for a few nights. I did as JoAnne asked and sprayed down the tops of the mattresses (after flipping them so the bottoms were now the tops) and wiped them down with a weak vinegar solution to kill the mildew. I set them off and began work on the battery compartment, located quite inconveniently beneath the bed, just under the boards that are the surface for the mattresses. I pulled out the old (dare I say “ancient”) hydrometer and opened the first battery to check the specific gravity of the cells. First the hydrometer began to come apart in my hands. Second I realized that lo and behold, there’s no visible fluid in the cells. Ack. Bad news. I had spoken to the marina who said they “were regularly checking the boat and batteries”. Today I confirmed they were merely checking the charging status on the panel, and never once went into the compartment to actually “check the batteries”. Double-ack…. Mistake number one, assuming that people are doing what they actually say they are doing. So, I open all the batteries and they are all very low. I used filtered water (no distilled available, verified I could use it first of course). I put between 4-6 ounces into each cell. That’s a lot. That means at least a half inch or perhaps more of each cell was exposed to air and this is not a good thing for batteries. I went ahead and closed everything up and started checking the charging station. We have a “smart charging system”, built by Xantrex called a Heart 2000R (monitor). There is my second mistake…. I’ll get back to this in a minute. In the mean time, JoAnne and I went out, had a couple beers, ate some food, came back. I noted a slight odor which seemed familiar but JoAnne said “Smells like the vinegar to me” and I assumed it was. Mistake number three, not investigating more closely. After while, I thought the smell was stronger. And it was. I then investigated. Walking into the aft cabin, it was HOT in there. Probably 85 degrees. WAY hotter than it should have been. Then it hit me. The smell. Well, the identification of the smell. Sulfur from batteries. YIKES! I shut down the charger, removed all the mattresses, bedding and cover and the heat coming out of the battery compartment was stifling. I switched off the system and starter batteries by using the big switches. I could still touch the batteries without being burned, but they were literally boiling inside. I quickly opened all the hatches, head, windows and turned on fans to blow out any fumes and likely hydrogen (I have a scar on my forehead to remind me to do that stuff, where a battery blew up when I was about 15 or 16). I placed another small DC fan on top of the batteries as soon as I was sure the fumes were mostly cleared out, mostly to dissipate the heat, and cool the batteries. I checked voltages, which seemed fine. But man, were those batteries hot! Mean time, now it’s getting late. We didn’t get to actually go to bed until around 1AM probably. The batteries were warm all night but I put the bed bad together. I kept getting up to check the system to make sure everything was still disconnected, the charger wasn’t kicking on, and nothing was going to catch fire. We packed up some emergency stuff, including car and boat keys, our computers and wallets and grabbed some clothing to evacate if necessary and I found a knife to cut the boat loose from the docks in an emergency. I figured if there were a fire, I’d at least try to kick the boat away from the docks to prevent the fire from spreading. Two fire extinguishers remained close by and loose, along with flash lights. As far as I could tell, I had everything prepared and well in hand for any emergency. But fortunately the heat was slowly dissipating. At 0400 I was awake again, and really only dozed on and off after checking a couple of things. All seemed fine. Finally, I figured out that the “smart charger” system isn’t as “smart” as you would think it would be. In October or November I had bought our second battery bank to add. One of the things I didn’t know, Mistake number two, was that you have to reprogram the system to know how large the batteries were. That is the capacity. We went from 230 amp hours to 460 amp hours. The Heart monitor needed to changed. Didn’t know that. I figured like most things with computers, the system would sense the batteries and capacity and adjust. Nope. Mistake number one, I spoke to David the dock master this morning and he confirmed, “No, we just check the charging status….”. Oh, wow. Even knowing that we were gone for several weeks, out of state and couldn’t get back and I’d specifically asked him on the phone to check the batteries? “Yup”. Double-wow. I went to the store to buy a new hydrometer. Four whole dollars. Should have bought two, but they only had one. Came back, removed coverings, bedding etc and started all over. All of the cells read properly at between 1.275 and 1.32 for specific gravity. So, obviously the batteries are charged, perhaps slightly over-charged. They over heated but, not warped. No damage. I downloaded the manual for the Xantrek Heart 2000-R and read it. Not all the way through, but enough to grasp my mistake with the settings. I corrected those. I have since turned on the charger and it DOES shut back down. In the process of doing all this, I discovered one more problem. Apparently, half of the boat is connected to the starter battery, including a bilge pump and some lighting. What????? Holy cow, I’ll never figure this out. I’m going to wind up rewiring the entire boat I think. Some of the wires don’t meet AYBC standards and some have “sawed through” in the middle of the boat (when we were in the Chesapeake Bay caught in the rough weather and I have rewired a few things to bring back my chart plotter). I can’t even imagine what kind of problems I’m going to find behind bulkheads when I try to fix these issues. As of this minute… the batteries do charge, they still “heat a bit” but nothing like that night. They probably need equalization, but I’m not going to run that until I’m at a different location. I’ve had absolutely ENOUGH bad luck here. This afternoon, after testing all the battery cells and writing all that information down in my little engineering book I started keeping (along with a simple schematic of the battery wiring I can see easily, without having to hang upside down in bilges and under toilets for now) I started on the engine. I checked all the fluid levels. They all were good. I’ll need to add a small amount of oil when we start our drive north, but everything was good. I opened the seacock for the engine intake, punched the glow plug button for 10 seconds and hit the starter. The Perkins turned over and fired instantly, just like she was all warmed and ready to go. I stepped off the boat, walked around to the exhaust and she was blowing out white smoke and a lot of antifreeze. At least they had followed through with that part (which I had paid for…). The water is coming through great, plenty of pressure and plenty of water from the exhaust. All good. I placed the transmission into gear and gave her a little throttle and the shaft started turning, everything sounded good, and water was being pushed back, all was good. Took her out of gear and let her run for awhile, while I looked for leaks, drips, spraying water, or anything wrong with the engine. All good. I left the engine running for about 30 minutes. Probably should have let it run longer but I didn’t think that necessary at this point. As of this time, 1600, I’m done, writing this blog and having a beer. I pronounce the system “ok”, but I’m not confident in the charging system at this point. I do have the downloaded manual, and I’ll get one of the inverter, charger and the brain of this thing and study them better. I am pretty much through trusting the word of anyone in a Marina who says “Yeah, I did that thing you wanted done” until I check it myself. We had issues in Stony Point Marina. The guy running the place was a pirate. I’ve refrained from posting this to this point, but it’s time others know about these places. I’ll write that up in another post later… but suffice it to say he was trying to have me “pay cash” for some things and didn’t want to give me a “receipt”. Had that happen with a cop in Michigan once passing through with my Colorado Plates. I basically forced the cop to give me a receipt and wound up getting ALL my money back for a ticket I shouldn’t have gotten in the first place. (Another long story). This marina is very good about saying they will do things.. but they take their time, and right in their paperwork they make sure you know it doesn’t matter if it’s their fault, mine or a contractor, you’re paying for your time on their docks no matter whose fault it is the work isn’t being done. They’ve started charging a “live aboard fee” to the folks who actually stay here. Of course, they gotta pay for their new docks too I guess…. We are moving next week. I cut a better deal at less than half the price of this place. About time we got a break somewhere besides bones and wallets…. Last night was as scary as the storm on the Chesapeake Bay. My children will tell you I am absolutely psychoticly paranoid about fires. Last night was the worst of my nightmares attempting to come to fruition. A fire. On a boat. On the water. Under my bed. Worst fear. I hate spiders and I’d face one of those down that is my size, before I’d want to deal with a fire. I considered for a minute God has been trying to prevent JoAnne and I from doing this thing. But, you know… if He wanted us dead He had Cancer. He had heart attack. 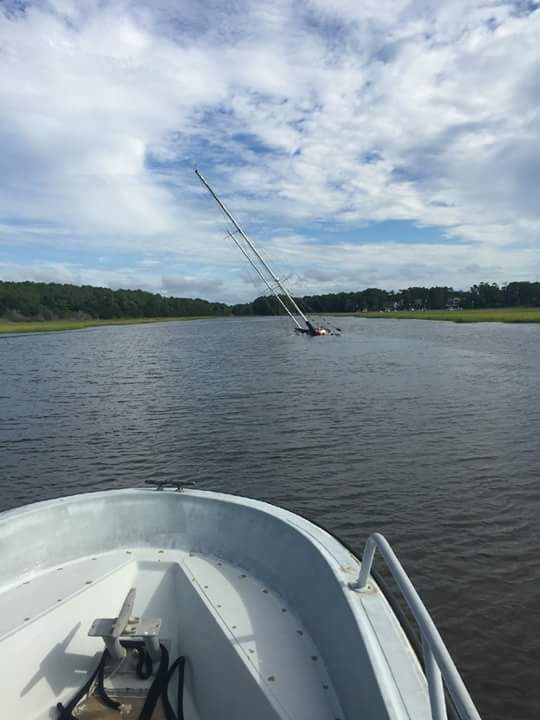 He had a wind storm on the Chesapeake. He had a truck almost hit us head on (my fault mostly). He has had multiple opportunities through out the last seven or eight years. If God wanted us off the planet, he’d have taken us away. I don’t for a second believe in “Bad Luck”. Or Good Luck. I believe luck is what you make of life. You do things to prevent bad things from happening. That’s what luck is. Make sure you dot your i’s, cross your t’s, get your insurance, pay your dues, whatever it takes to simplify things ahead of you. Nothing we’ve done has been deadly. But everything we’ve done has been a learning experience. Learning is what we humans do. Then we move on to something new. Time to move on, to a new marina. New projects, a new place and new friends further north.